Happy Holidays guys! I realize the year is not quite over yet. But we’re close enough. We’re headed off to Japan tomorrow for the next couple of weeks. 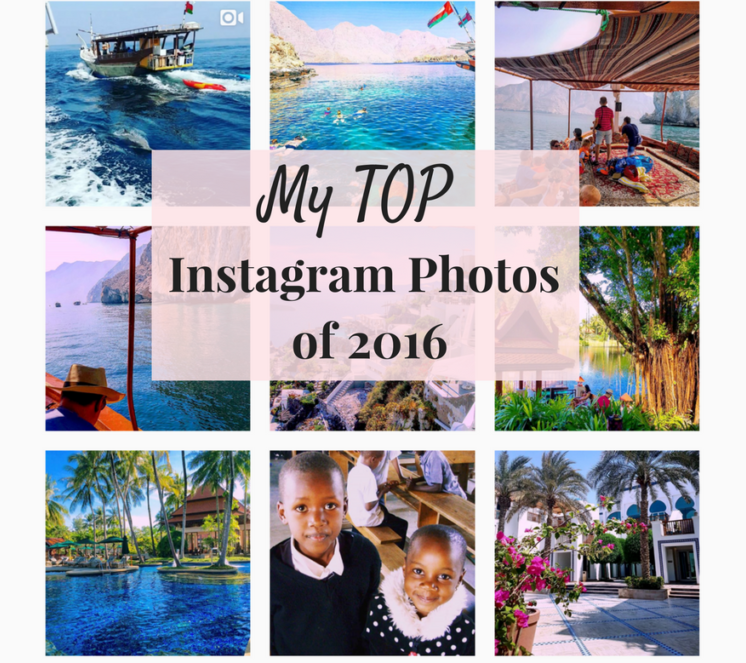 So I wanted to share with you now my top Instagram photos of 2016. It’s so hard keeping up with all the social media platforms that travel bloggers are active on! Did you know that many hire a social media manager to do it for them? I haven’t reached that stage but my focus tends to be on a chosen few. Instagram happens to be one of them. Are you following me yet? 🙂 I’ve compiled my best Instagram photos of 2016 right here. The photos below were chosen based on highest engagement by Instagram users following me at the time. I’m almost at 4,000 followers. Woohoo! My goal for next year is 5k. Wish me luck. #12 Taken at one of my favorite hotels in Dubai, the Park Hyatt. It’s an older hotel but I love the relaxing feeling and Mediterranean vibe here. Great views of Dubai Creek too. #11 This one of me lost on the King’s Highway in Jordan seemed to be a hit. Haha. #10 If you follow me on Instagram, you’ll know that I am absolutely in love with the Sultanate of Oman. The pic below captures the natural beauty of this country so well. #8 This one is of the outdoor atrium at the Park Hyatt Dubai. Obviously, we come here often. As the caption reads, Instagram users love photos with symmetry! It works. #6 Another throwback photo of Machu Picchu certainly caught the eye of a few in 2016. Maybe it was the different angle they liked. Whatever it is, I’m happy. #5 Not surprising, another photo taken in Oman made it to the list of my top Instagram photos of 2016. This one is of the magnificent chandelier inside the Sultan Qaboos Grand Mosque located in the capital port city of Muscat. #4 Here we have the entry to Petra, known as the Siq. It’s one of the most beautiful places I’ve had the pleasure of walking through. And Jordan is one of my favorite trips of 2016. #3 Another flashback photo I posted in 2016 from my gorilla trekking trip to Rwanda in 2011. The situation with the gorilla, Harambe, being killed at the Cincinnati Zoo this year prompted the post. It was the first pic that I ever crossed 200 likes on back in May. I was excited. #2 You guessed it, another pic from Oman. Seems that I’m not the only one who loves this place. #1 And of course, a pic from the place I’ve called home for the last 9 years. Dubai! Taken from a restaurant at the Burj al Arab, you know …the hotel that looks like a sailboat. I hope you enjoyed my Top Instagram Photos of 2016. Hit follow on any of the pics above to keep up with my latest travels. Have a wonderful and safe holiday season everybody. Keeping my fingers crossed for a peaceful 2017.